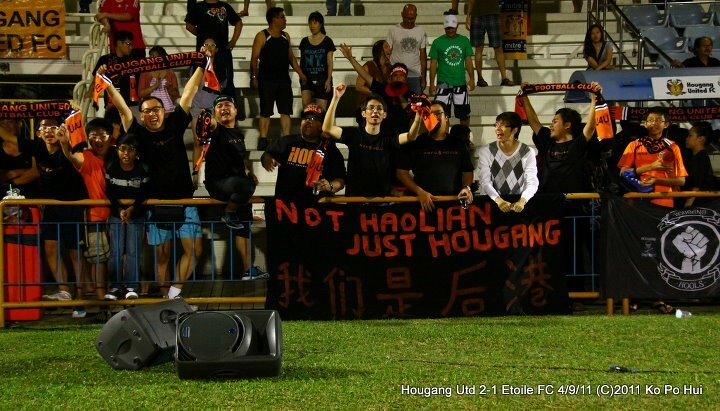 A moment of improvisation from Azhar Sairudin earned Hougang United a morale boosting 2-1 victory over defending champions Etoile FC as the league schedule resumed on Sunday evening. The 25 year-old had missed his club’s last couple of matches due to suspension but showed again on his return how much his market value has risen this season. In the 67th minute, not long after Etoile has cancelled out Vitor Borges’ first half opener, Azhar pounced on a loose clearance off a freekick, evaded a challenge, before firing in a half-volley with the outside of his right boot to give the Cheetahs’ the initiative for a second time on the night. It was a lead which they never relinquished. The game was even from the start as Azhar and his partner Carlos Delgado sought to tussle against the ever-improving Theo Raymond in the centre of the park. On the wings, Cheetah Jordan Webb and the Etoile’s Sirina Camara were also looking in menacing mood. 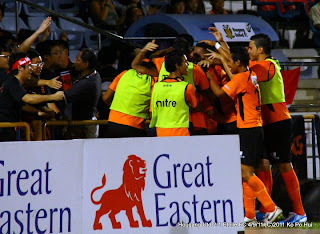 Hougang took the lead in the 23th minute as Delgado’s smart distribution left Webb one-on-one with an Etoile defender. The fleet-footed Canadian proceeded to storm his way down the by-line and setup Borges for an easy finish. The French side tried to hit back with a couple of in-swinging corners that caused the home team a few scares. However it was only in the 40th minute through Raymond’s freekick that Fadhil Salim was really tested. The Hougang custodian’s steady hands proved vital in neutralizing the threats in this instant and many others during the match. Early in the second period, Etoile upped their tempo and coach Guglielmo Arena followed up by unleashing his wild cards in the form of Aly Doumbouya and Hicham Bouchemlal at the 59th minute mark. Five minutes later, the game was levelled as defender Selim Kaabi nodded home from close range after good work from Jonathan Toto off a Raymond corner. Next came the moment of improvisation from Azhar, which went in off Etoile’s keeper Antonin Trilles’ left post. This sparked jubilant scenes as the players celebrated the delightful goal right in front of their die-hard faithful. Doumbouya, Bouchemlal and Raymond all had decent chances at goal but none managed to seriously test Fadhil after that. Thus, it was left to Trilles to produce the save of the night as the French keeper tipped over from Brazilian substitute Diego Oliveira’s flying header in the 89th minute. At the other end, Cheetahs’ captain Shariff Samat and his defence worked effectively to repel the French attempts late in the game to hang on for the three points. Speaking to sleague.com after the game, Cheetahs’ coach Aide Iskandar was evidently a happy man. “This is a result of good team discipline and everyone taking responsibility, it was never an easy game against a well-drilled team, especially after three weeks’ break”. “But it is good to see us start winning against the top teams again, which is good for team morale leading to the semi-finals of the Singapore Cup”, he explained. The former national skipper also had kind words for his match winner, “No doubt Azhar has potential, his technical abilities allow him to make those good passes”. With his side’s recent good form having been halted by this defeat, Etoile coach Arena was visibly unsatisfied. “Our individual mistakes cost us. Hougang did not have that many good chances to score, except the header at the end”, he commented through his translator. He then vented his frustration at the absence of proper facilities and a perceived unfairness in the way the league fixtures were rescheduled. “We did not have goalposts at Queenstown for training till three days ago”. He added, “This weekend is a FIFA date for internationals, but Etoile had to play, minus our two players”, referring to the absence of Franklin Anzite and Serge Souchon on national duties. “It is not correct”, as he lamented the fact that other title challengers were not scheduled for action. Next up for Etoile will be a tough battle against the Albirex side on Wednesday night and Arena will certainly hope his team can rediscover their winning mentality then.